Posted August 20, 2013 by Heather Michet & filed under Plant Talk. Long held belief that it wards off evil spirits: it was said to not grow in the gardens of evil people – a good personality tester! 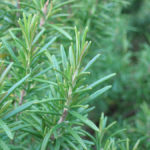 Rosemary’s leaves were placed under the bed pillow to do away with nasty spirits and ward off bad dreams. Branches were burned in the 14th & 15th century homes to ward off the Black Death. The wood of the plant was used to make lutes & burned into charcoal, then crushed into a powder to keep teeth healthy. In WW II, Rosemary and Juniper were burned in French hospitals to kill germs – a practice we’d be wise to modernize and implement today with all of the MRSA and other community virus & bacteria outbreaks. Stimulant of nervous & circulatory systems, also pelvic region. Pungent, distinctive flavor which harmonizes well with poultry, fish, lamb, beef & game – particularly when the meat is roasted. Great with tomatoes, eggs, cheeses – especially goat cheese! Combined w/ fresh garlic, it makes a lovely infused olive oil to pair with peasant bread chunks as dippers -perhaps with a touch of balsamic vinegar! Use the infused oil in salad dressings, marinades…let your creativity pour out!